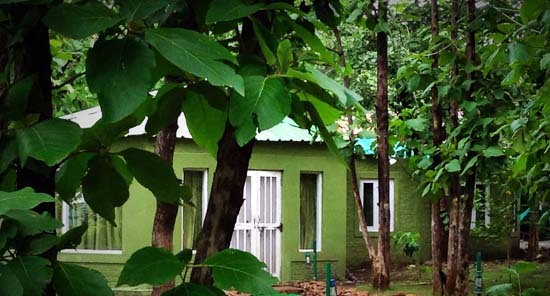 Nestled beautifully near the hill side, on the north side of the property is an exclusive cottage, hexagonal in design & shaps, with an area of 260 SqFt. The cottage has a dressing room of about 50 SqFt and a spacious Bathroom of about 120 SqFt. The Ceiling Height of the Cottage is about 10 Feet. On the three frontal walls of the cottage, we have large glass panelled windows for a panoramic view of the hillside and the lake below, as also the property and a wide two winged door, for entry. Medium Size, Fridge, with Chiller. Ingredients for Tea / Coffee etc. House Phone for Internal / External Communication. Basic Toiletries to cater to two people, double occupancy, such as Toilet Roll, Soap, Shampoo, Toothbrush, Comb, Toothpaste, Moisturiser. King-Seater Sofa Sets, Centre Table etc Mirror in the Dressing Rooms. 8 X 8, 64 SqFt, supersized Bed, with side tables. At the north east side of the property, we have constructed Six (06) Large, Spacious and Luxurious Suite Rooms, in a completely separate wing, build in the old Victorian Design, with each room size at 280 (14 X 20) SqFt, with an attached dressing room sized at 50 (10 X 5) SqFt and a bathroom sized at 90 (10 X 9) SqFt, thereby making each unit at 420 SqFt. The false ceiling is at an height of 18 feet, with Light Ventilators on both ends. The Suites have a large glass frontage for the view and are furnished in the best possible manger. Each room offers a large sit out in the common varendah in front. Teakwood Sofa Sets, Centre Table etc Mirror in the Dressing Rooms. 7 X 7, 49 SqFt, supersized Bed, with side tables. On the southwest side of the property, offering perhaps the best view from their exclusive veranda, are three cosy rooms, with their exclusive, well furnished living room, and a sprawling veranda in front. The RJL Deluxe rooms are slightly smaller in size, with two rooms identically designed, sized at 225 SqFt (15 X 15) and one room at about 240 SqFt. The rooms have a dressing room, of about 40 SqFt (4 X 10) and spacious bathrooms of about 100 SqFt (10 X 10). The height of the false ceiling of the rooms has been maintained comfortably at 10 Ft. Additionally, there is a small exclusive dining area with a table for 6, in the same wing, in addition to the large and spacious Living / Sitting / Drawing Room, in which these three rooms open into. The aforementioned make this the best option for a large family or a group of three families / friends, travelling together, as they can then have this villa wing exclusively to themselves. Laundry Basket in the Dressing Rooms, teakwood emperor chairs, amenities table, centre table etc Mirror in the Dressing Rooms, Shelves Rack. Large Sized Twin Beds, 6'1/2 X 6'1/2 Ft 42 SqFt. Two Large Towels and Two Hand Towels (Complimentary, but on demand). Near the southeast side of the property, surrounded by large verandas, sized at about 800 SqFt, is the RJL Recreational Lounge and Fitness Centre This is an area wherein we encourage the guests or their children to spend time, during the day, when it may be too hot outside, or it's raining or simply when they wish to enjoy some fun and games. We are in the process of slowly developing a well equipped reference library and already boast over a 100 book and magazine reference section. We can safely say that may have the largest collection of National Geographic Magazines in our reference section. We have numerous books for Children and Kids. 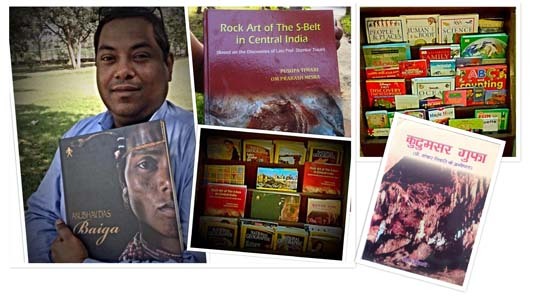 We have books about the Culture, Tribes and Wildlife / Butterflies / Birds of Madhya Pradesh, for people to see. We have been given a small counter by the MP Tourism Department, wherein we are displaying the books, booklets and pamphlets of the various places and destinations of MP, for our guests to see and learn / become aware of. Extra Bed: - Rs. 750/-. Imp:- We can permit up to only one extra bed in a Tent and two in the Room for members of the same family, below the age of 18. Room Service Available for your Comfort & Convenience. For Adults, Rs. 1000/- per person, per day/night, for all three meals (Lunch, Dinner). Breakfast is complementary. 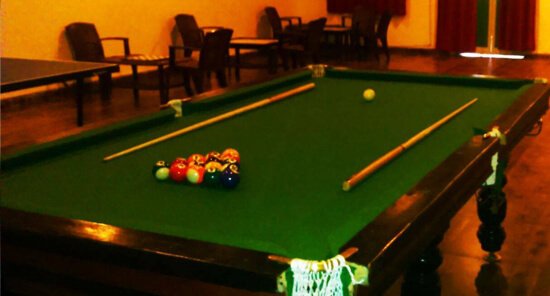 In Day Outing Swimming Pool and Indoor games charges has to be mentioned separately as 750/- for Swimming Pool and 250/- for Indoor games. Children between 5 - 8 years are charged at 50%. Children above 8 years are charges as adults. We require the ID card for age verification, for availing the benefits of S. No. 1 & 2, here-above. Meals are an elaborate Buffet layout, Veg & NonVeg, the menu of which can be shared with you, should you so desire. The Evening Point (open, seating 30), with complimentary evening Bonfire, after sunset. The Golaghar (covered, seating 50). The Varendah by the Lawn (covered, seating 30). We have a Live Kitchen as well, with a Grill and Tandoor as well, to take care of your 'Starters'. 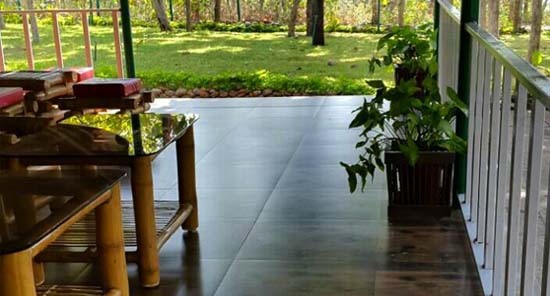 We have a very large deck, known as the Evening Point or the Upper Deck, which offers a panoramic view of the Kolar Reservoir and also the Jungles and Hills, in front. 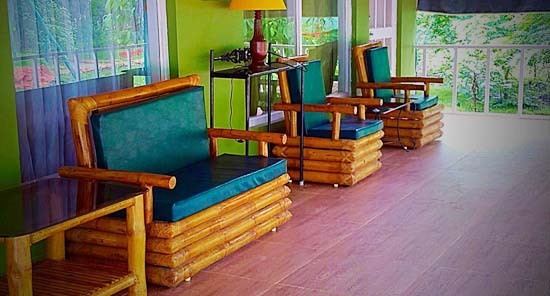 We have a series of decks closer to the reservoir, connected by two stairways, known as the Lower Decks, which take us closer to the water and also allow us to enjoy the Jungle and the Lake from closer quarters. We have a variety of options for the Dining Spaces for people to settle down and enjoy their meals, as per their taste and preference of ambience.